It is quit an interesting place, because maps mention the name of an antique town called Archaia Ereinia (in the middle text in red). 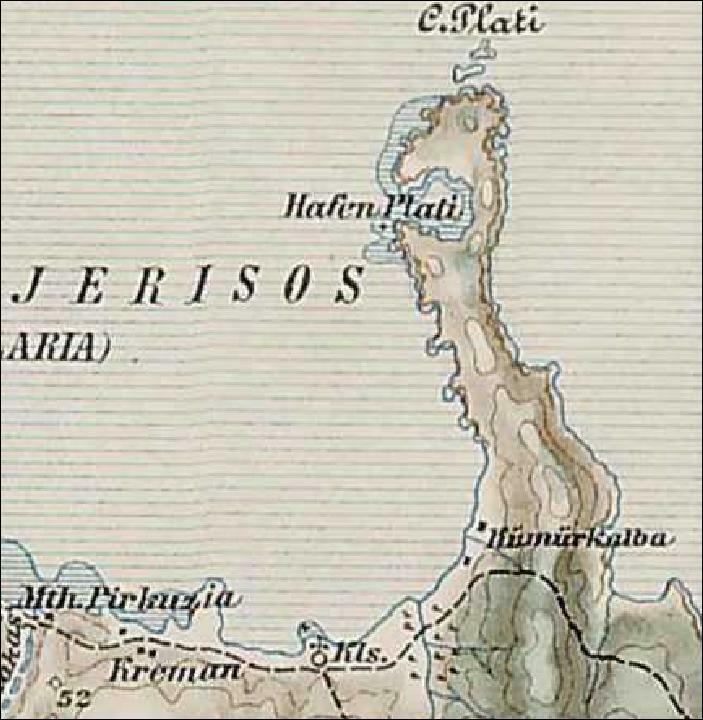 On this map you can also see some houses scattered over the cape. On this map the maker calls this town Dion and ruins are drawn. 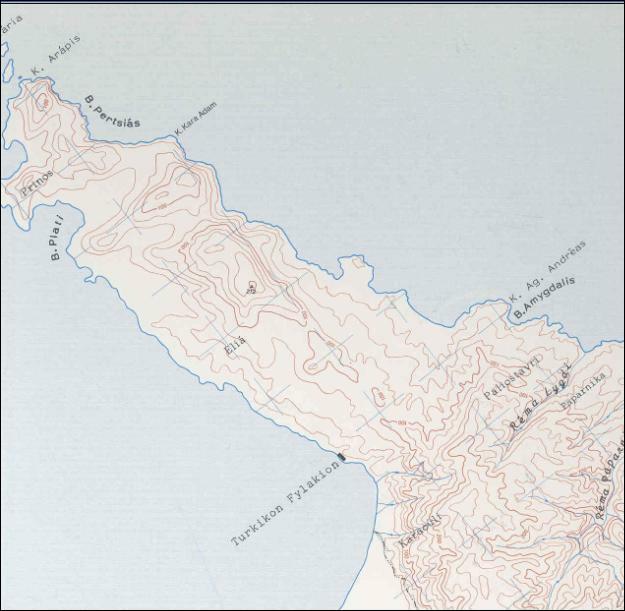 On this recently published map the name of chapel Elia shows up, and the same name Elia is to be seen on the first edition of the Zwerger map. 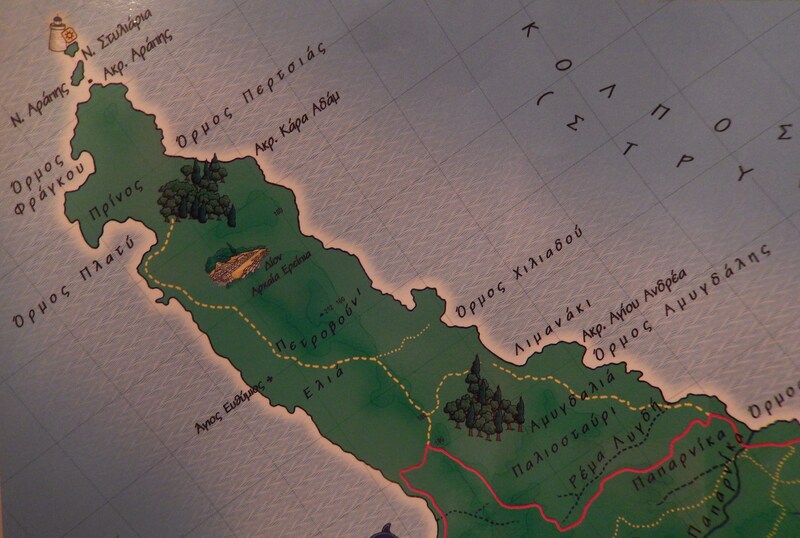 Here also the name Turkikon Fylakion appears, on later versions of his map this name disappears again. 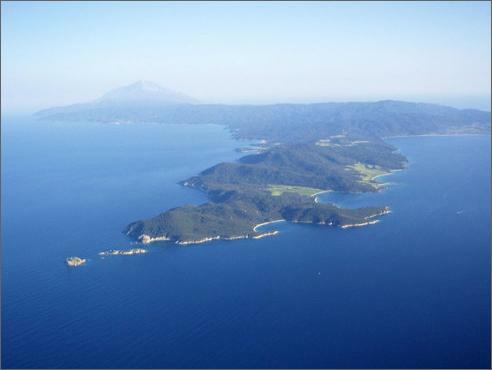 and seen from the air. Who will be the first one to visit Cape Arapis and try to find out if actually an ancient city once stood there? This entry was posted in history, ruins, trip 2013 and tagged arapis. Bookmark the permalink. Some additions to this post: (a) besides the church or ruin of Elias there are two chapels on this part of Athos: one dedicated to Ag. Efthimios about halfway at the west coast, and Ag. 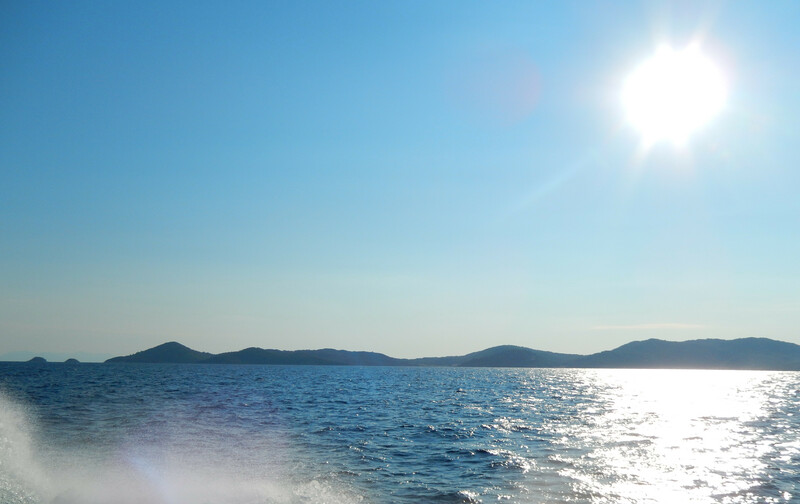 Nikolaos in the north nearby the Ormos Fragkou. (b) The name Archeia Eripia means ‘archaic ruins’, in which ‘archaic’ refers to the period of Mykene, or Homer, or the classical period. 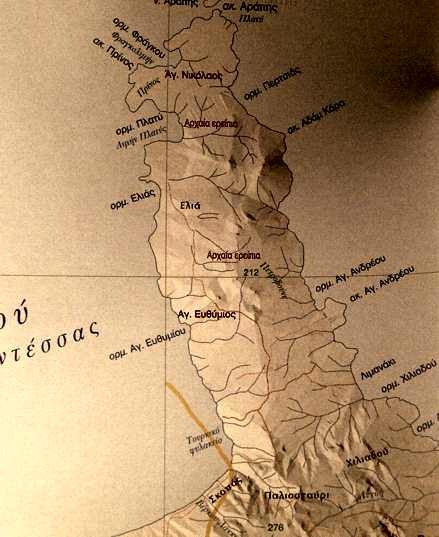 The city was probably not Dion (Strabo), which layed probably halfway on the northcoast of Agion Oros. 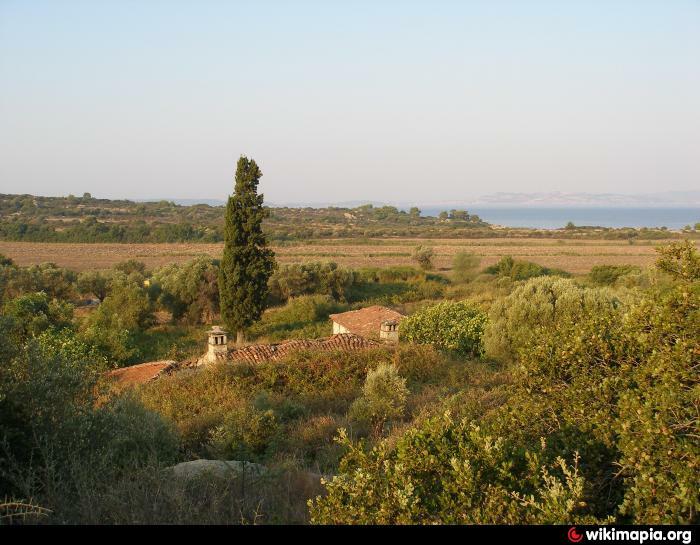 (c) The word ‘fylakion’ means ‘army post’ or ‘border post’, compared to the village of Fylakion nearby the turkish border with the ill famous camp for illegal transpassers. 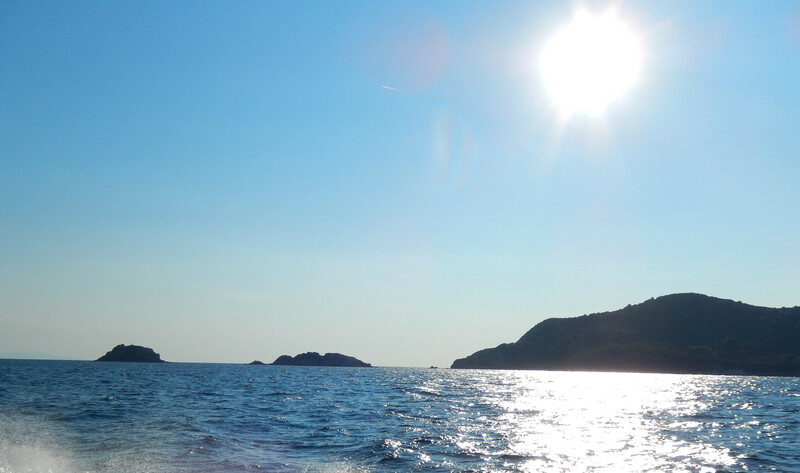 So the name refers to a former turkish army post, as there was also one halfway Ouranoupolis and the border of Agion Athos on the hill at the coast. Seing post #1860, with more images of cape Arapis maps, I decided to contribute by uploading yet more of them into this, somewhat more apropriate post. 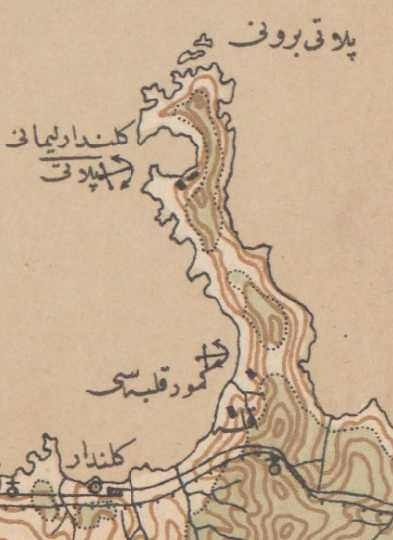 I am uploading three maps, an ottoman one of 1901 (Rumeli-i sahane haritasi), the one from Mylonas (2000) and the newest one of the national cartographic centre (2002). First the oldest one, the ottoman one. 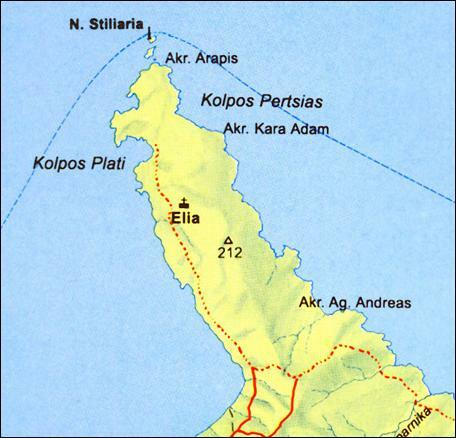 Strangely, it names the whole peninsula as cape Plati (Pilati burnu) and not Arapis. At the place of Plati cove it reads Plati port and down below, as seen also at the Austrohungarian map posted in this page above, it reads: Komurkalbesi which means ‘Heart of Coal’. 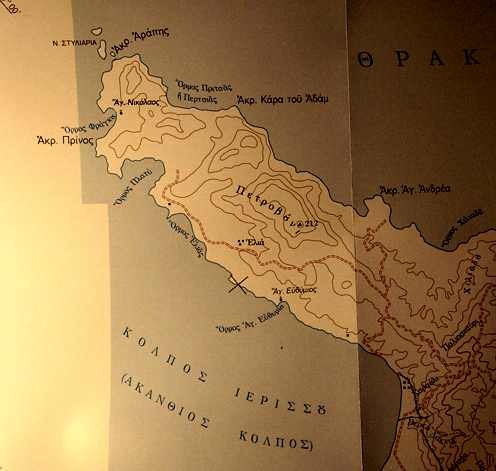 Probably there were coal production facilities at the area at that time..
Mylonas’ map shows some buildings at Elia settlement, two chapels, Ag.Nikolaos and Ag.Efthymios as well as a couple of other scattered buildings and the Karaouli station (named ‘tourkiko fylakio’ on other maps). Ekexxak (national map librarys’) map on the other hand which supposedly did a lot of work on the field trying to create a a totally new map from the beginning rather than base it on older works, displays no evidence of buildings but also shows two areas where ancient ruins have been actually found (based on excavations of Papaggelos & Paliompeis). 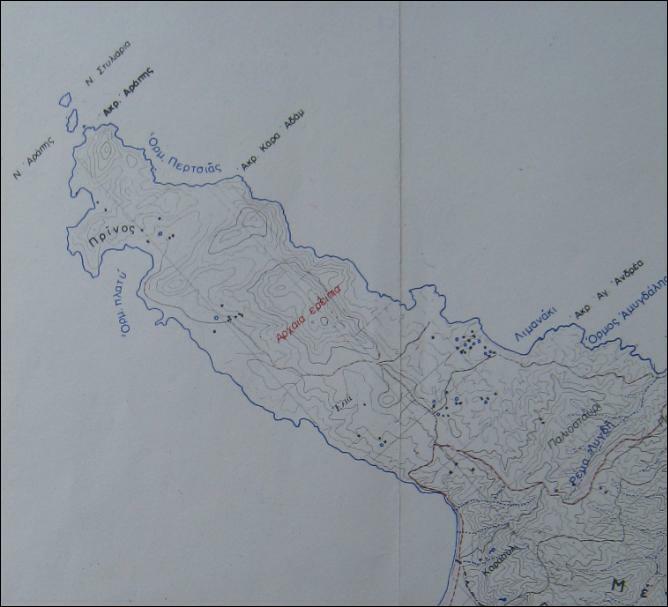 Interesting is the name of a smaller cape at the southern side called “Kara tou Adam” as seen on the maps. This could be translated as ‘Holly head of Adam’ which sound religious enough but does not make any sense. In turkish however, the world ‘kara adam’ translates as ‘black man’ or …Arapis. 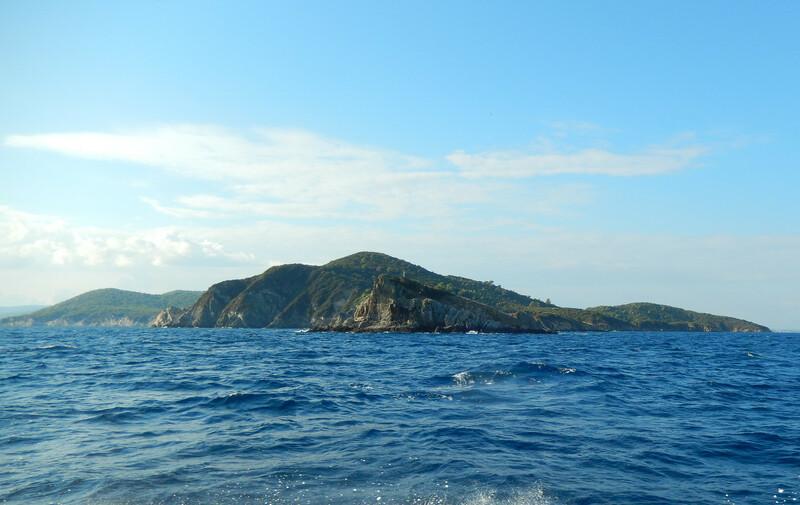 Apparently, the photo below, taken from wikimapia, another nice tool for ‘armchair travelers’ to Athos, depicts the remains of the only known settlement of Arapis at Elia. The newest detailed satellite footage on mt.Athos recently released from Google maps, shows the aforementioned buildings at Elia in an abandoned state with their roof collapsed, but looking carefuly about 200m to the north, a new building is shown that looks like a kelion with a chappel unlike the older ones. Would anyone have any info on the subject?